My sister and I enjoyed a girl’s night out at one of her local restaurants called Oakleaf in her quaint southern town of Pittsboro, NC. This is one of the great examples of just how much North Carolina has grown up over the past few years and has gained some sophistication when it comes to food and wine. This restaurant describes itself as “Farm to table”. Awesome! When we arrived at the restaurant it was about to pour with rain. I mean POUR. We hurried in and made it before the deluge began. The building was unassuming and not what I was expecting at all. It appeared to me as though it had been a small factory of some kind in another life. When we entered, the building was so cool, it had an industrial feeling. 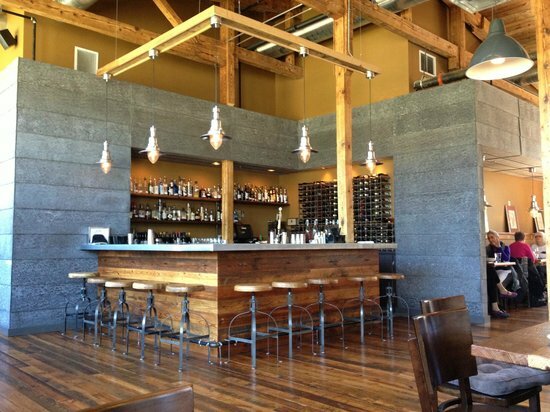 There is a Meadery (a honey wine maker) and a Co-op grocer that share the same building as the restaurant. I don’t think you could get much more hip, trendy or foodie than that. The building was beautifully done using the industrial space taking the existing architecture and turning it into a thing of beauty. Moving into the restaurant was more of same. The decorator actually used photographs of industrial images and blew them up and used them on the walls as art. It was clever and cool. The restaurant was minimal and interesting. The place was open, and modern, yet retained lots of character. It almost has a trendy New York art gallery feel. I absolutely loved it. Who would have guessed this would be in a small southern old fashioned town 40 minutes outside Durham? Great! As we had reservations we were seated immediately. Our waitress was not only competent, but she was on top of it! We couldn’t have asked for better service. She was very concerned that we had all that we needed. That was very nice. Waters and wine were brought in the blink of an eye. She was knowledgeable about the menu. I thought she was both friendly and pleasant without being in the way. 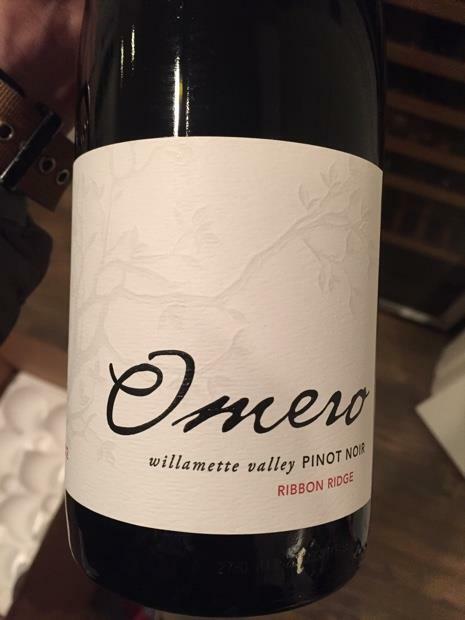 I ordered a bottle of Omero Pinot Noir (from Oregon) for our evening to share without knowing what we were going to eat. What a great choice. We were both very impressed and pleased with this nice little wine. It was fruit forward and silky, with a light body and smooth finish without being at all sweet. It was great with the fish as it wasn’t too heavy. 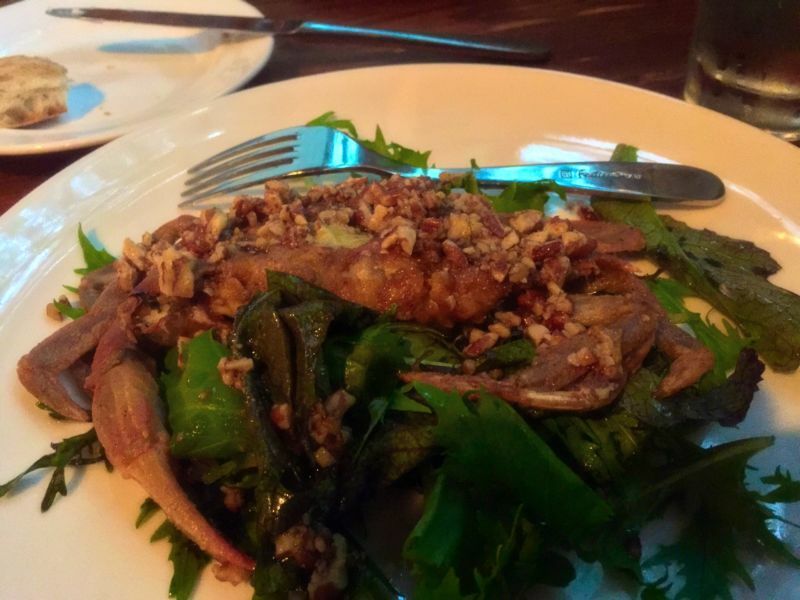 For my appetizer I ordered the Soft Shell Crab with the Toasted Pecan Meuniere to start. This was a beautifully presented dish. The pecans were indeed toasted beautifully, but I feel they overwhelmed the light crab flavor as there were too many. The dish was cooked perfectly however, and overall I really enjoyed what I ate. 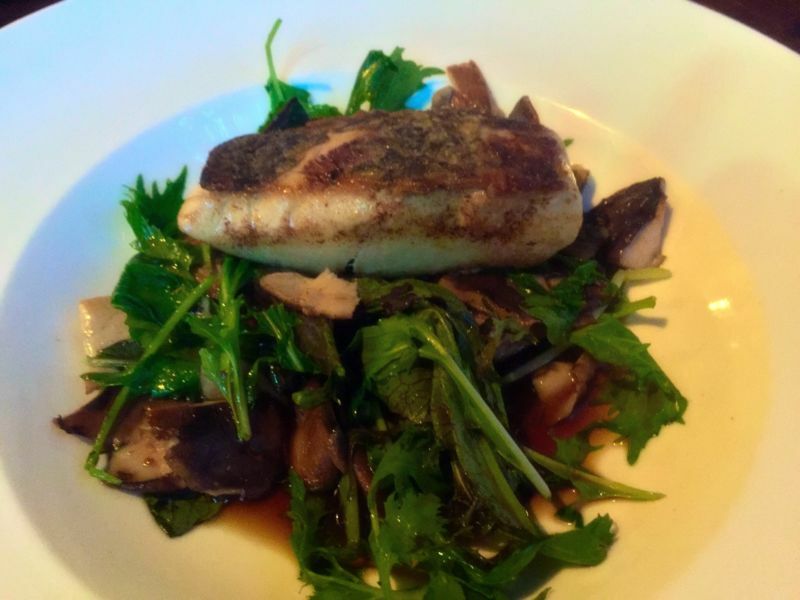 I moved on to the Wild Alaskan Halibut with foraged ramps, on a bed of mixed green leaves. 5 stars for presentation and beauty of the dish. 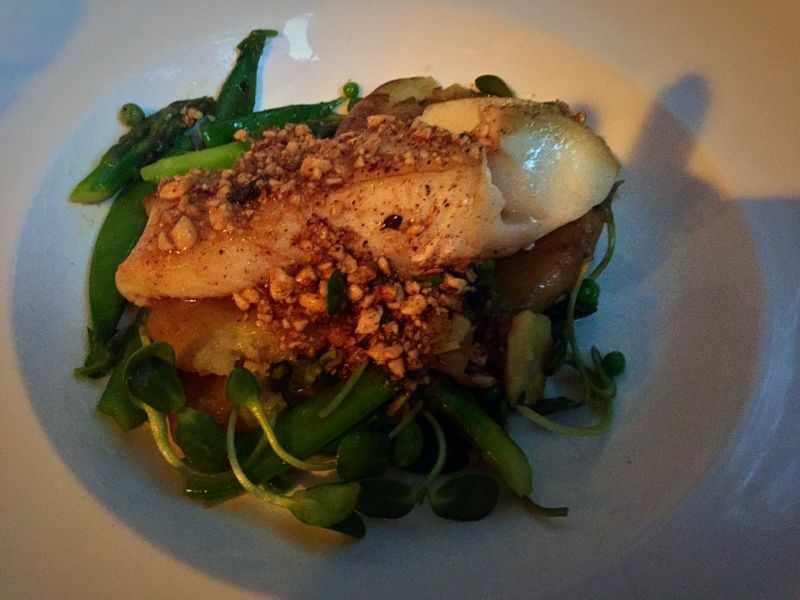 Light and flavorful, just what you want from a fish dish. It was fresh and perfectly cooked which allowed the flavor of the fish to shine. I really enjoyed my plate. When ordering the desert, I really wasn’t sure what a Budino was. I was intrigued by the sound, so I ordered it. My sister ordered the Double Bergamont Earl Grey Creme Brulee. I have to say that my dessert was the only thing that was a disappointment in the entire meal. The Budino ended up to be a very dry dense not even a cake, honestly I don’t know how to describe it. 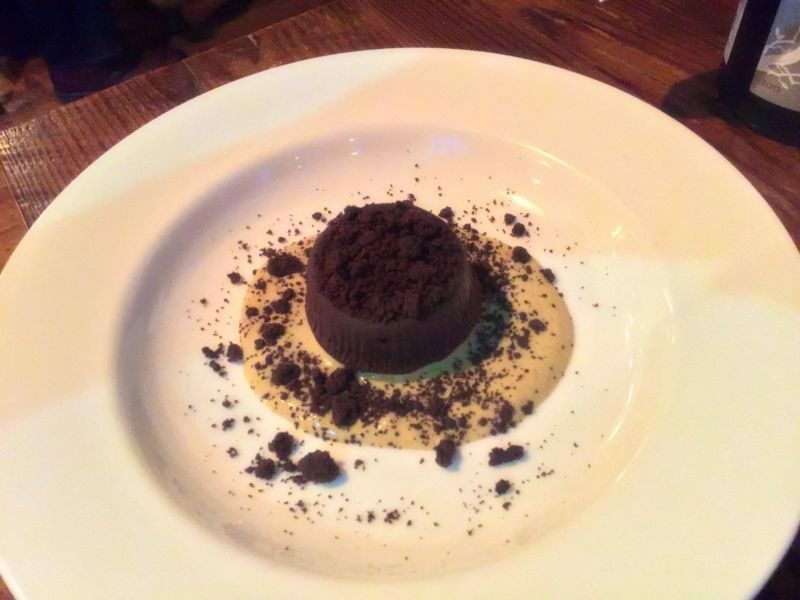 It was like chocolate chalk in my mouth. It’s only saving grace was the gorgeous espresso sauce it was sitting in. I had one bite and cast it aside. It was a complete fail. However, I wasn’t expecting to enjoy the Creme Brulee but that was a total winner! The Brulee had a great snap when the spoon went in, nice caramel flavor, then the soft bergamont flavors in the pot. It was very nice and light. 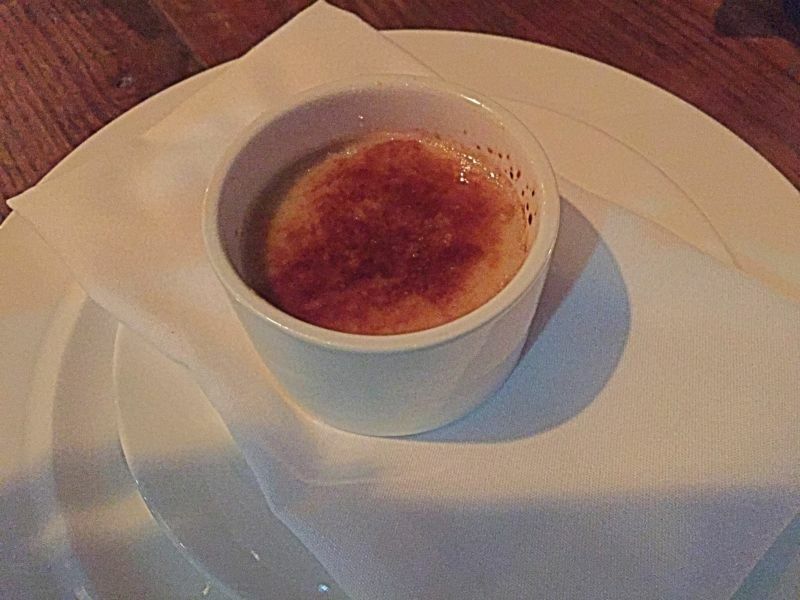 I am not a Creme Brulee girl at all, but this was very good. Overall I thought this restaurant was excellent. The service, the food and the ambiance. I would absolutely eat there again the next time I was in town to see what new things the clever chef has to offer. Front Room at the Wharf, Vallejo, CA.